Architect Guy Luscombe recently returned from a study trip in Europe focusing on living arrangements for older people. His comprehensive report featuring case studies from Portugal, Spain, Switzerland, Germany, Denmark and Netherlands, reveals eight key design features important to older people. He says, “The traditional ‘nursing home’ and ‘retirement village’ are not only outdated, they can actually foster separation and ‘otherness’, isolating people from their family, friends and interests. The aim of this project is to explore how architects can design better environments for older people that improve their enjoyment of life. It starts with rethinking some of our design language.” Many in the universal design movement would agree with this. The NSW Land and Housing Corporation has updated their Building Design and Product Requirements. and Design Standards. Although this video is about the specific requirements of one person, it shows how some design features, such as level entry into the home, could make a difference right from the outset – for everyone. Edited transcript from live captioning of the presentation by Shawn Neilson and Joel Elbourne who outline the process of engaging with developers to encourage the uptake of Banyule City Council’s Liveable Housing Design Guidelines in new housing developments. They show how it is possible to get buy-in from developers using local government resources. The title of their presentation is, Improving housing for people across their lifespan. Edited Transcript in PDF or in Word document. Link to presentation slides and transcript of 2016 outcomes so far. Although this set of guidelines was published in 2008, the information is as relevant today as it was when first published. The designs and costings were well researched and there are sample plans for all types of dwellings. 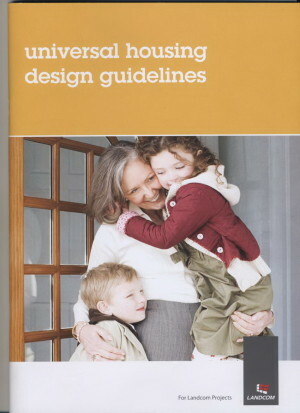 These Guidelines went on to form the underpinnings of the Livable Housing Design Guidelines (Silver and Gold levels) in 2012. Note: these Guidelines are no longer on the Landcom website. They have been archived in Trove (The National Library of Australia Trov).